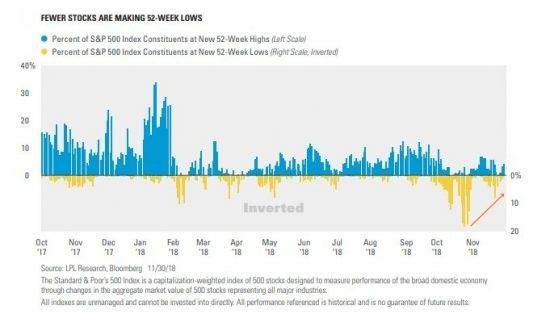 Despite the broad sell off yesterday fewer stocks made new 52 week lows than at the October lows. This is a good indication that the October lows will likely hold. The S&P 500 Index closed Tuesday 100 points above the October lows. The S&P 500 Index fell 3.24% on Tuesday, its 5th drop of 3% or more in 2018(most since 2011). In all of 2017 the index fell 2.8% from peak to trough. A drop of this size in December is quite rare, it has only happened three times in history(1987, 2000, 2008). In all three prior occasions the Index closed the month higher. Prior to Tuesday’s sell off the Index had put in its best six day gain since the February 2016 lows(+6%).